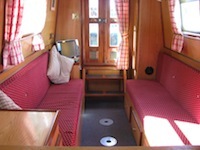 The Spirit class canal boat is rated 0 Stars and can sleep up to 6 people. 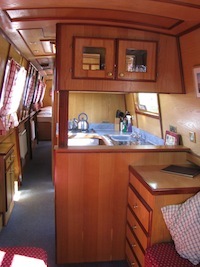 DESIGN: This class of boat is 57ft long, 6 berth cruiser stern narrowboat. It has a quiet water-cooled diesel engine with simple to use controls. 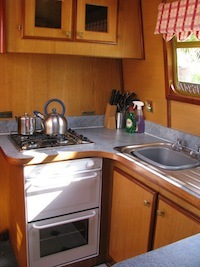 KITCHEN: The kitchen is fully equipped and has a 4 burner gas cooker with grill and oven; refrigerator (4 Cubic ft with small icebox); sink and drainer; saucepans; cooking utensils; cafetiere; kettle; crockery and cutlery appropriate for the number of berths. There is plenty of storage space and work surfaces. BEDDING: Freshly laundered bedding is supplied for each crew member, as per your requirements. Towels are also supplied - one medium sized towel per crew member, and one hand towel per bathroom. 2 Pillows ber berth ( 1 x feather, 1 x foam). Mattress Cover per bed. Duvets and Covers. BATHROOM: The bathroom comes complete with a wash hand basin, superior Macerator toilet, and a full size shower. A 240v shaver socket is also available. There is a separate toilet as well. Airing Cupboard.